Many companies and institutions manually process thousands of purchase invoices every year. Staff within the Account department staff spend a lot of time and pay a lot of attention to this process. Invoices are manually entered and then submitted to the authorising officers for checking and approval, after which the invoices are kept in a paper archive. This manual process is not only time consuming but it is also prone to errors. Invoices can be lost and valuable archive space is taken up. 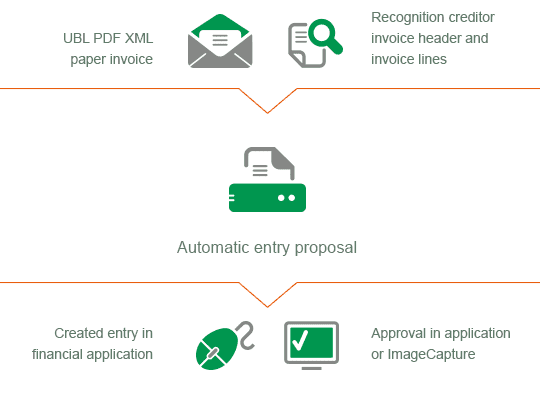 Automated invoice processing with imagecapture for invoices, an integrated process. By automatically processing invoices you cut out the time consuming and costly stages of processing and you always have a full overview of your records. ImageCapture for Invoices is intelligent scanning and recognition software that easily allows you to digitally enter and process digital and paper invoices on your record accounts system. Because ImageCapture seamlessly integrates with all standardised (financial) applications, there is no need for periodic synchronisation of the database tables. Authorisation of your invoices can also be included in ImageCapture. If you are already using a workflow solution for authorisation, ImageCapture can be seamlessly integrated. On our ERP and financial links page you can find details of all the available links for ERP and financial applications. Is your application not shown on here? Scan Sys is continuously developing new standard links for ERP and financial applications. Please get in touch with us for more information. As well as offering automated processing of your invoices, ImageCapture Web also offers a large number of links, allowing you to digitally authorise your invoices. After the invoice has been read an automatic entry proposal is created which allows you to indicate who you want the invoice to be authorised by. The entry is then created and put on hold in your system so that you can immediately have an insight into your costs without running the risk of the invoice being paid without it first being checked and then released for payment. ImageCapture sends an automatic message to the person authorising the invoice, informing them that the invoice is ready for approval. The person appointed to approve the invoice opens their ImageCapture Web environment to view the invoices, approve them, reject them or forward them to a colleague, adding any comments as necessary. After the invoice has been approved, the invoice is taken off hold in your system and can be seen in the payments due list. The digital document is automatically enriched with an appendix page, on which a full audit trail can be viewed including remarks concerning the authorisation of the invoice. The use of ImageCapture has ensured that the financial processes became a whole lot more flexible. We barely find any errors. Our creditors are paid on time, exactly to the day, and the most important thing: our people have time to do what they do so well, their core business.